Bestlaminate Blog A helpful resource for your laminate, vinyl and hardwood flooring projects. 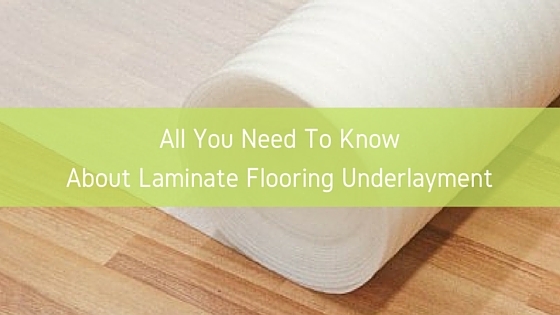 Underlayment is an important step for any laminate flooring installation. There are several factors you will need to consider when choosing an underlayment. Learn more about what you should know before buying a laminate flooring underlayment. It is a thin foam pad, often made of polyethylene or polypropylene, which is laid on the sub-floor before installing the laminate. Most laminate floors on the market today require an underlayment to be installed. While there are manufacturers who offer floors with an underlayment attached, this is a special feature and is not included with all products. Laminate flooring underlayment is available is a wide variety of styles. Why is Flooring Underlayment Necessary? Laminate flooring is not nailed or glued down, so it needs some form of cushion between the subfloor and laminate to allow it to float easily. Think of it like a large jigsaw puzzle, which will be expanding and shifting as the climate changes. To avoid any damage due to friction between the laminate and your sub-floor, the underlayment must be laid first to give the laminate a smooth surface on which to float. Which Underlayment Should I Use? 1. What Is Your Sub-floor? If you are installing laminate over a concrete sub-floor, it is very important that a vapor barrier is used to prevent any possible damage due to the moisture released by the concrete. This is simply a sheet of thin plastic material, like Visqueen Vapor Block, that will stop any moisture from being absorbed into the laminate core. Many of the underlayments from Bestlaminate offer 2-in-1 or 3-in-1 underlayments, which include a vapor barrier as well as padding. This saves you the time and money associated with installing a separate vapor barrier. If you are installing over a wood or existing subfloor, you will not need to worry about a moisture barrier underlayment. Unless you require other properties, such as sound reduction, a standard foam underlayment will work for your project. 2. Is This A Second Floor Installation? If you are installing your laminate floor in an apartment, condo, or on the second floor of your home, you may want to consider an underlayment that offers noise reduction. Many apartments and condo associations require a minimum sound rating from the underlayment. While laminate flooring is quiet to walk on, noise can easily be transferred to the floor below without the proper underlayment. Choose an underlayment, like Floor Muffler or Roberts Super Felt, that will give you a high sound reduction rating. What If My Laminate Has Pre-Attached Underlayment? If your laminate flooring already has underlayment attached, you would not use another underlayment. Adding extra padding will put stress on the locking system and could cause your locking systems to break. The underlayment attached is meant to save you time from installing underlayment. The exception to this rule is if you are installing above a concrete sub-floor. Attached underlayments will generally not have an included vapor barrier. You can install a thin vapor barrier that does not have extra padding to keep moisture from damaging your floor. If you’re looking for a higher end underlayment with thermal or sound reducing properties, we would recommend finding a floor without attached underlayment and buying a higher quality underlayment for your needs. While looking at underlayment for your laminate floor, you may come across STC/IIC with a number next to them. What exactly are these and what do they mean? Put simply, these are ratings that tell you how well the underlayment will dampen sound. The higher a number is following these letters, the less noise will be transmitted. The effect of this is mostly noticeable in rooms underneath the room in which the underlayment and laminate are installed. This is why many apartment buildings, commercial offices buildings, and condo associations require a minimum rating where sound is concerned. The Sound Transmission Class (STC) and Impact Isolation Class (IIC) ratings are measured in decibels reduced for certain types of sound. The STC rating pertains to airborne noise, such as voices, radio, television, etc. The IIC rating measures impact sounds, such as footfalls, dropped objects etc. The transmission of these sounds through floor/ceiling assemblies (such as those found in multi-level homes and apartments) will be inhibited by underlayments with higher STC and IIC ratings. The International Building Code (IBC) states that all multi-family buildings must have a minimum sound insulation rating of STC 50 and IIC 50. In addition to the STC and IIC ratings, some underlayments may also have a thermal rating, or R-value. This refers to the underlayment’s ability to conduct heat. The higher an R-value is, the less heat will move through it. Many homeowners prefer an underlayment with a higher R-value to keep their feet warm in the winter months, however, if you have any kind of radiant heat system, a high R-value can inhibit its effectiveness. R-values are measured in ft2*°F*hr./BTU, where °F is equal to the difference in temperature (in degrees Fahrenheit) between one side of a material and the other. An underlayment which has a value of 3 ft²*°F*hr./BTU will typically be represented as R-3. To put this in perspective, the typical R-value of a bat hitting fiberglass insulation is R-3 to R-5. Many polyethylene foam products have an R-value of 2-3, such as laminate flooring underlayments. First up is our series of basic underlayments. These are the most simple, cost effective underlayments we offer at Bestlaminate. All three of our basic underlayments are suitable for most installations, though they do not offer many features. These are the most popular choices with contractors, due to their low price and effectiveness in allowing the laminate floor to float. The most basic option will be the standard underlayment. 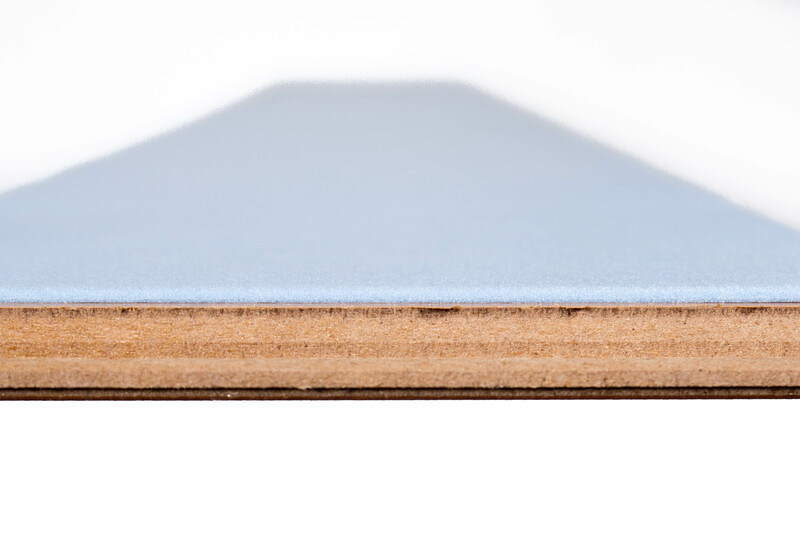 This is a great option for installing over plywood, oriented standard board (OSB) or existing sub-floors, where a moisture barrier is not required. The Standard Underlayment will absorb minor imperfections in the sub-floor, giving your laminate floor a smooth, even surface on which to float. Bestlaminate’s 2-in-1 Vapor Underlayment is another great option for basic installations. Made from the same low-density 3mm polyethylene as our standard underlayment, the 2-in-1 has the added protection of an attached moisture barrier film. This makes it a safe choice for installing your laminate floor over concrete sub-floors. Like the Standard Underlayment, this material will fill minor imperfections in the sub-floor, giving your laminate floor a smooth, even surface on which to float. The third option in Bestlaminate’s series of basic underlayments is the 3-in-1 Vapor Underlayment. Another polyethylene foam, this one is only 2mm thick, making it better to use under thinner planks. Unlike the Standard Underlayment and the Vapor 2-in-1, the 3-in-1 comes in pre-packaged rolls of 100 ft². This underlayment has an attached vapor barrier and the added feature of an adhesive strip. All of these underlayments are low density polyethylene. While none of them have been subjected to sound or thermal testing, they do offer some sound reduction, and are suitable to use over radiant heating. The Standard Underlayment and 2-in-1 Vapor Underlayment do not come in pre-packaged rolls, and can be cut for custom orders, making them a great choice for anyone who does not want to purchase an extra roll to get that few extra feet2. Next up is our series of silent underlayments. These are the next tier in underlayments that we offer at Bestlaminate. All five of these silent underlayments are suitable for most installations where sound dampening is key. Some of these underlayments also have vapor barriers attached, so be sure to look for these as you will get more bang for your buck if you’re installing over concrete subfloors. These are the most popular choices for people living in multi-family homes or apartments, or those who don’t want to hear their children playing around upstairs. If you’re looking for something that will help to muffle sound, but won’t break the bank, the 3in1 Silent Vapor Underlayment by Feather Step™ is a great option. This incredibly durable underlayment is a 2mm, cross-linked polypropylene, giving it a higher density than the open-cell polyethylene foam underlayments. Because of this, the Feather Step™ Vapor 3-in-1 absorbs sound and offers enhanced moisture protection. 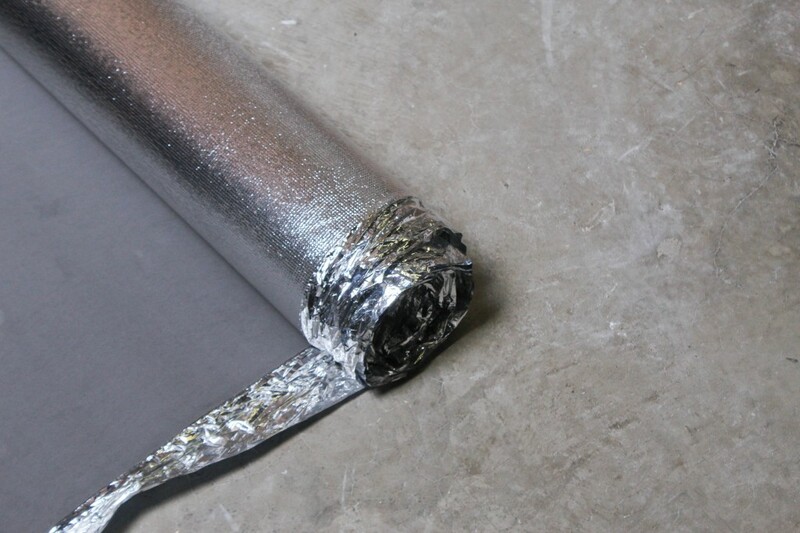 The attached foil moisture barrier works in conjunction with the foam itself to ensure that your floor is protected from any vapor given off by the sub-floor. This underlayment includes an adhesive strip for easy installation. ProVent Silent Vapor Barrier Underlayment is one of the best values where laminate flooring underlayment is concerned. This polyethylene foam is 3mm thick and comes in pre-packaged rolls of 215 ft2. An attached vapor barrier protects against moisture, but it doesn’t stop there! ProVent underlayment is specially designed with micro ridges that, when walked on, actually pump moisture out to the sides of the room to vent out moisture. This underlayment is a great choice for any job, including basements, first or second floor, apartments or condos. The Kronoswiss® ProVent can be installed over any type of sub-floor, and will absorb minor flaws, giving your laminate the proper surface to float. The First Step™ underlayment from Roberts® is one of the most popular choices in the laminate industry. Another great option for muffling sound, the Roberts First Step has an air flow layer which is similar to the Kronoswiss® Pro Vent. 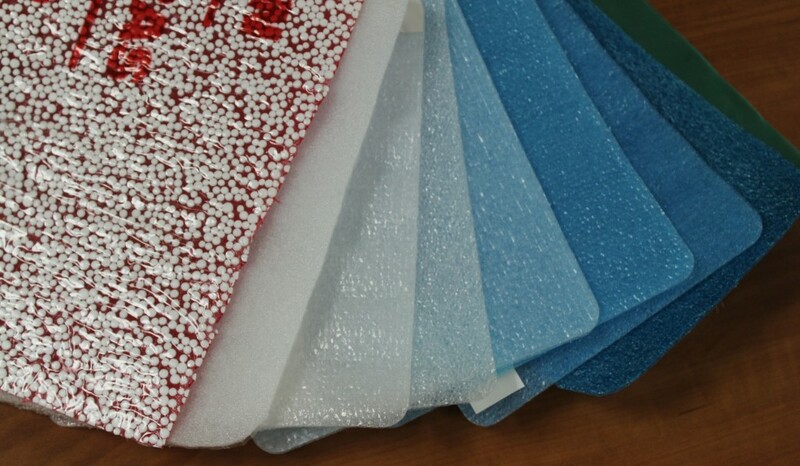 Polystyrene beads are substituted for a foam pad, allowing air to move freely through the underlayment to vent- preventing harmful mold and mildew build-up. This patented design also allows heat to be easily conducted, making this an excellent choice for sub-floors with radiant heat systems. The Floor Muffler underlayment is the top of the line for sound reduction, with the highest STC/IIC ratings on the market. This makes it the number one choice for multi-family buildings around the globe. Similar to the Feather Step™ vapor 3-in-1 underlayment, the Floor Muffler® is made of a cross-linked polypropylene to give it more density. This directly contributes to its ability to cut down on unwanted noise. This also helps to block moisture, though it does not have a vapor barrier attached. 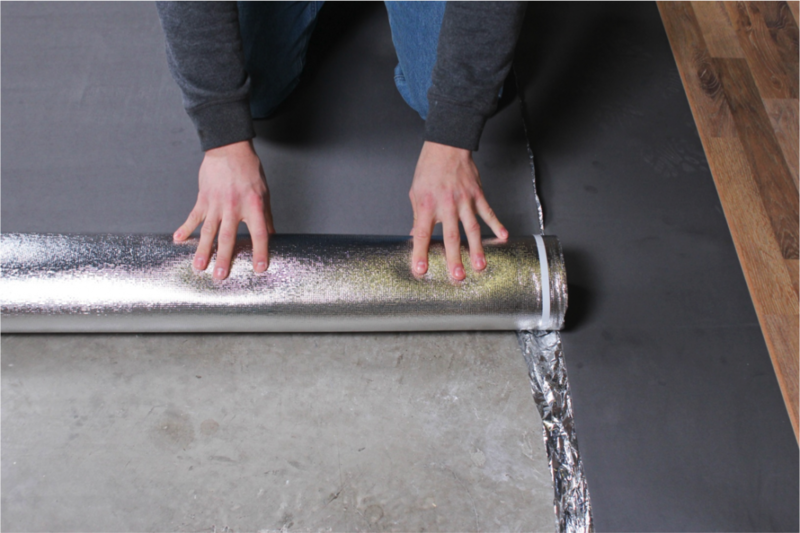 The density of the Floor Muffler® underlayment keeps out any vapor released by your sub-floor, making it a safe choice to install over concrete subfloors. Roberts Super Felt Premium Underlayment provides you with superior sound dampening, insulation and a vapor barrier. This is a superior choice for installation of laminate and engineered wood flooring. 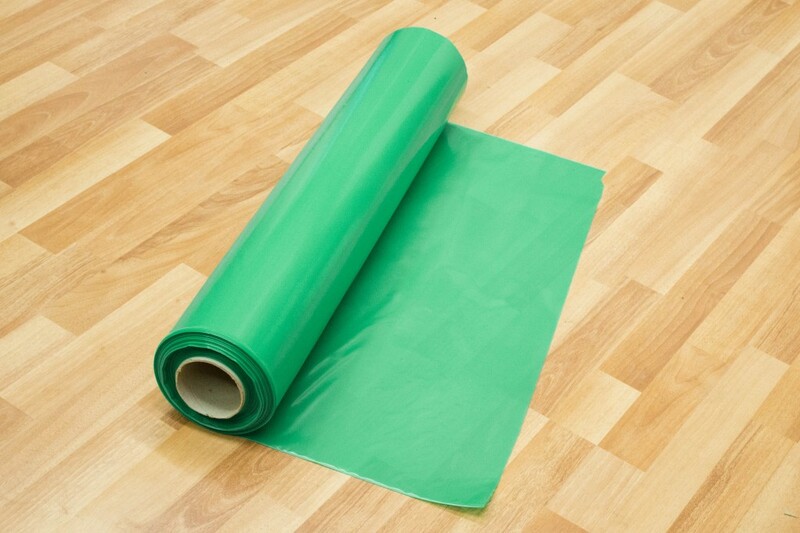 This underlayment is available in convenient rolls containing 100 sqft or 360 sqft each. Durable and easy to install, this underlayment comes with a tape strip to easily seal the rows of underlayment together. Visqeen PE Vapor Block PE Film is not an underlayment, but simply a vapor barrier sheet that may be used as on concrete sub-floors. This is the perfect option if you are laying a floor which has a pre-attached underlayment on a concrete slab or any other stone floor where there is potential for moisture. Along with the underlayments listed above, we have many more options for your laminate flooring underlayment. You can view all of our underlayments here. Each underlayment is a little different and has their own manufacturer instructions. You must read the instructions to fully get an understanding on how to properly install. We’ve prepared a variety of installation tutorials that will give you graphical step-by-step guides on how to install your underlayment. Below is a table with the specifications for all of the products listed above. Remember, not all of these products are subject to all of the same tests for sound or heat conductivity. Keep in mind the needs you have for your project and budget. While higher R-values and sound ratings are appealing, they aren’t always necessary. We hope this will help you in your search for the right underlayment for your laminate flooring project! Do you have more questions? Simply post it in our comments area. We will be happy to answer them all! How Much Underlayment Do I Need to Buy? Can You Put Down Two Layers of Laminate Flooring Underlayment to Reduce Noise Pollution? Bestlaminate’s blog is dedicated to you by making the home improvement process easier and more affordable. We hope to make your home remodeling and maintaining a more positive experience. What is the best solution for moisture barrier for a sunroom floor -wood as the base, not concrete? I’m looking to do 12mm laminate flooring throughout my upstairs and was wanting to put a sound reducing underlayment to (as the name implies) reduce the sound of foot traffic for the lower levels. Most the underlayment I’m seeing is 2mm or more putting my flooring a minimum of 14mm off the subfloor. What thickness would you recommend for the underlayment and is it possible to go to thick?? Need Help!!! We hired a contractor and remodeled our walk-out basement nearly 3 years ago. They took up berber carpet and ceramic tile and glued down engineered hardwood (concrete slab in walk out basement). We did not build the home so we are unsure if a vapor barrier was put under the slab when the house was built. Within a few weeks, the planks started separating and there is sever bounce in the flooring. We are still dealing with the issue and are getting ready to have it ripped out and start over again. Someone suggested luxury vinyl planks. We have teens, two big dogs and the pool is off of this area. Should we consider laminate, luxury vinyl or something else and what about underlayment? Please help – we would really like this resolved so we can on with enjoying our home and our lives. Hi Laurie, I would 100% recommend using vinyl flooring as this would keep you clear of any moisture issues. We are going to take up the carpet in our living and installingl laminate flooring. The subfloor is wood and it’s above a concrete basement…The man where we bought the laminate said we needed a underlayment, but the flooring already has it.We put laminate in our hallway an 2 bedrooms about 9 years ago and never used extra underpayment. My uestion is do w need to use extra underpayment if the flooring already has it and do we need to use a vapor barrier since the subfloor is wood , but it’s above a concrete basement. Hi Bib, thanks for the question. You should never use double the underlayment. If you’re installing over a wood floor, you should not need any additional vapor barriers! Hi I have an old Mobil home with floors that are not even. I know that I should try to level floor first but it I don’t can I glued the pergo plants directly to the sub floor to try and prevent seams from separating or buckling. I know planks were intended to floor but can I glue them down anyway. Thank you. Hi Lisa, thanks for the question. You will cause even more issues by gluing down the planks. We would not recommend this. We’d recommend looking into a glue-down vinyl floor in this case! I’m considering a laminate that already has the underlayment attached, and I will need a vapor barrier (concrete slab). Is there a vapor barrier that provides some additional thermal insulation that can be used in this case? Hey Jay, typically if a floor already has a pad attached, you can’t put another layer of padding down. This will cause too much flezing and cause the floor to buckle. I would definitely recommend checking with the manufacturer though! Can laminate be installed over cork flooring and if so would I still need an underlayment? If not could I use one anyway for added comfort? I have neuropathy which makes it hard to stay on my feet for long but I love to cook. If this would work, which underlayment would be best? I would be doing all of the house except bathrooms. I can’t do cork alone due to teenagers and pets. Hey Shelly thank you so much for reaching out. Laminate floor needs a foam pad to go over due to needing a softer material to help it expand & contract. So therefore yes you would need an undrlayment in this situation. Please let us know if you need any other assistance. Question…I’m looking at a NuCore Vinyl Plank from Floor and Décor for a floating installation in a 12th floor condo. The HOA requires sound proofing underlayment. The NuCore floor has an attached cork based underlayment but they offer no STC/IIC rating info that I can use to satisfy my HOA. Any suggestions? Thanks much. Very impressed with your site. Hey Paul, thanks for the question. Unfortunately there is not really another option to find the IIC/STC other than contacting the manufacturer or the flooring. You should be able to find general studies/testing done on cork though, not specific to the floor. 1. If I am installing this under the laminate in the lower-level on concrete, do I need a vapor barrier also along with this underlayment? 2. What is the cost of this underlayment for 1000 sq feet. Hello Ash, thank you so much for reaching out to us! The Roberts Super Felt has a vapor barrier attached already (the greenish side that is uniform is the vapor barrier). This product is $35.99/100 sf, so you would be looking at a total of $359.90. All orders leave within three business days with a transit time of two days to Virginia via FedEx. Please feel free to contact us if you have any other questions. We are installing laminate flooring in 2 bedrooms on wood subflooring. I want as quiet and as warm underlayment as possible. Which would be best – felt or the thin foam? HI, 3 story townhouse on plywood sub-flooring. Don’t believe I need vapor lock but would like to keep the noise level down from the 3rd and 2nd floor. Can you please recommend your top 3 options? Let me know so I can make the purchase today. Thanks in advance! Hi Eric, thanks for reaching out. Here are three of our best options for laminate flooring installation. Please let us know if you have any other questions! Thanks! Making my purchase now. My floor has a slight give to it when it’s walked on. There is a vapor barrier under it and it was installed in my basement over concrete. Thanks! Hi Angel, thanks for your comment. Laminate flooring is a floating floor, and it floats on top of the underlayment you have installed. Depending on the flooring and thickness, it is possible for laminate to have a slight give, when compared to flooring such as hardwood or tile that is permanently secured to the subfloor. We hope this helps! We are doing our bedrooms in Kronoswiss Laminate. It will be laid over a concrete slab . What would be the BEST underlayment for sound reduction? Hi Samuel, great question! I would recommend the floor muffler underlayment or the felt. 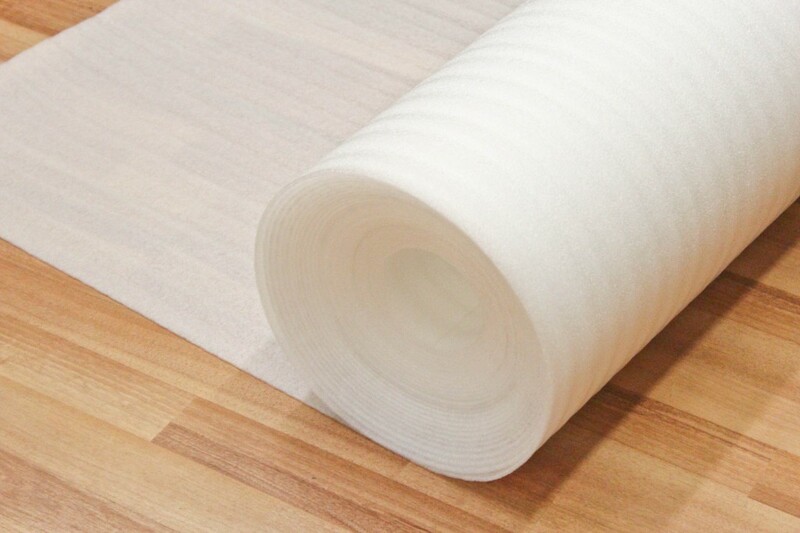 You can find them here: https://www.bestlaminate.com/floor-muffler-ultraseal-2mm-underlayment/ and https://www.bestlaminate.com/bestlaminate-felt-cushion-premium-underlayment-with-vapor-barrier-100sf-roll/. Both have a vapor barrier and great sound reduction. Hi Denise, thanks for your question! You should put the luan down before the felt. Your subfloor will need to be sturdy and in good condition before starting your installation. You will put the underlayment on top of the subfloor and the laminate directly over it. Be sure to get a copy of the manufacturer instructions to follow! This website is excellent and I have learned so much! I have learned the people currently installing my laminate floor, have laid the underlayment upside down. It is similar to the Silver 3in1. So the silver side is up and the moisture barrier film is down. But it is being installed over linoleum. Should they stop and fix the underlayment or continue? The area in which they are working on is the kitchen, hallway, and living room. Hi Christina, thanks for your question! In this case, you should be fine. Regardless, it will keep any moisture out, whether the barrier is on the bottom or top. If it is going over linoleum, I’m thinking your moisture potential is very low, so the fact the foam is towards the subfloor should be fine. If it was going directly on concrete, I may re-install it with the moisture barrier down. Hope this helps! I sell flooring and a lot of the Vinyl and Laminate Flooring I push already has a backing on it but it doesn’t have nearly the cushion that some of the others but I’M SUPER GLAD I read about doubling up on underlayment as it could weaken the joint holding the flooring together. Makes a lot of sense but I also get on maybe why something without a cushion should be used under a pre-backed floor might still need to go over a vapor barrier when it’s over concrete. Thanks for your feedback Don! We appreciate you checking out the article. I recently rented a condo in Houston TX. Move in date was pending due to the installation of new laminate flooring being installed on the first floor. There is 2yr old laminate in the entire condo but the first floor was originally incorrectly installed without the use of vapor barrier over the concrete subfloor. The laminate was just glued straight to the concrete. All the planks are warped and pulling up. This is a warranty issue and the owner of the condo has been working with the store to remedy the situation. The flooring was delivered on Saturday. Today the installer came and told the owner there is mold under the old floor. Needless to say, the owner is quite upset and called to tell me move in will be delayed…(was to move on July 1st). My question is what is the process to remove the mold, reinstall the floor and how long should I expect this to take? As of 7/1, I will be homeless! Any insight is appreciated! Thank you! Hi Erika, thanks for your question! I am sorry to hear about your moving situation. To remove mold on concrete, you need to scrub the mold off with bleach. Waiting for the concrete subfloor to dry will be the longest part. You will need to wait until the concrete no longer is holding any of the moisture, hopefully within 1 to 2 weeks the moisture reading will be acceptable – 4.5% vapor emission rate or less. After that, it should only take 1-3 days to acclimate and install the laminate if skilled workers are hired to lay it in one day. Hope this helps! I had heard The laminate should be installed perpendicular to the underlayment. Is there any truth to this or does it not make a difference? We have a house full of (too much) furniture and gutting the living room to completely cover the floor with underlayment before laying the laminate will be nearly impossible. Is it okay to lay underlayment and laminate in the same direction in sort of a “lay as you go” scenario? Hi Ron, thanks for the question! It does not make a difference. All of our underlayments can be laid the same direction of the flooring. And yes, we recommend working lay as you go. Unroll one strip of the underlayment, add flooring, repeat. Just be sure to read the manufacturer directions before getting started and follow those. Hope this helps! Excellent. Thank you, Alana. That actually worked out better than the smaller bedrooms I did “all at one time”. Appreciate your advice! Help! We just had an 8mm Mohawk “Carrolton” laminate installed over a concrete subfloor using a 2mm rubber underlayment. It now has such a “hard” feel when walking on it that it hurts my feet (ankles, legs, and sometimes even hips) when I walk or stand on it. It’s very painful. Actually feels harder than walking on the bathroom tile floor or even directly on the concrete garage floor! I try to avoid walking on the new floor as much as I can – not easy, since it’s the kitchen, family room, and entry hallway. I can’t imagine spending the next 20 years doing this (and probably ruining my joints in doing so). PLEASE tell me – what is the best underlayment for shock-absorbing comfort (for the 8mm Mohawk Carrolton laminate being installed over a concrete subfloor)? That 2mm rubber underlayment is the only one the flooring company uses, but I know there are other choices out there. Also, we live in warm, humid South Florida, if that factors into the decision. This whole situation just amazes me, because the 12-year-old Mohawk “Country Cottage” laminate that we are now replacing (only due to water damage) is perfectly comfortable underfoot. It has some attached backing/underlayment and a separate (3mm?) underlayment laid down on the concrete. This is for the ground floor of a single-family home, if that matters. If felt is the best for shock-absorbing comfort, is it practical for use in warm, humid South Florida? Hi Lisa! I am so sorry to hear about the issues you’re having. Luckily, laminate can be uninstalled and re-installed! We have a wide array of flooring underlayments. 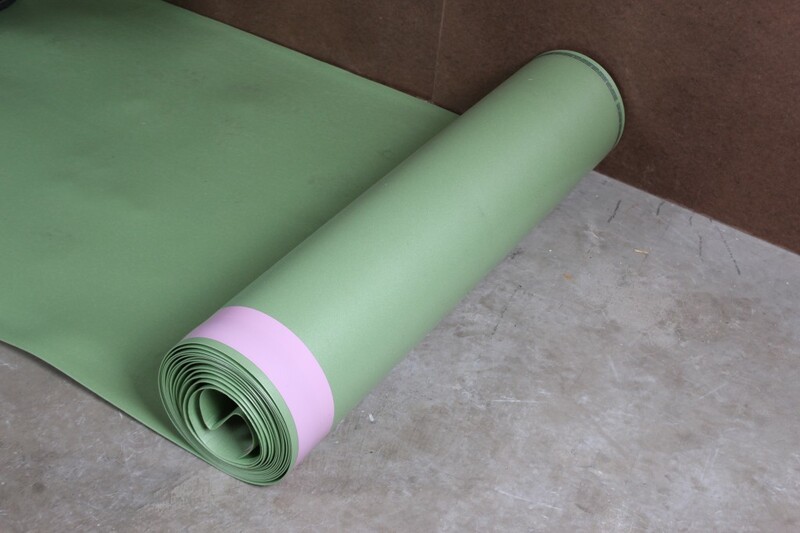 Here are the best for additional cushion that have a vapor barrier for your concrete subfloor: https://www.bestlaminate.com/roberts-super-felt-premium-underlayment-100sf-roll/, https://www.bestlaminate.com/vapor-barrier-2-in-1-underlayment/ and https://www.bestlaminate.com/feather-step-vapor-3-in-1-flooring-premium-underlayment-2mm-100sf/. Feel free to read the product reviews and decide what you think! I am installing a laminate floor with the pad attached. The subfloor is plywood. Normally I would place it right on the plywood. However, the floor was previously carpeted and glued down. The glue remnants are very level but still slightly tacky. I need to separate the tackiness. Can I use 6 mil poly over the tacky plywood and then place the laminate on top of that? I know this is an acceptable method for laminate over concrete as a vapor barrier. I am just wondering over plywood if the poly sheeting would cause a moisture problem. Hi Mike, thanks for your comment. That is a good idea, you can go ahead and install a vapor barrier such as Visqueen beneath your laminate, this will prevent the tackiness from getting on your laminate, and provide additional moisture protection for you. Please let us know if you have any other questions! Or better yet maybe roofing felt? Yes, roofing felt should be fine too! I don’t see anything about cork as an underlay? I know the cork wont provide much softness or bounce but I am wondering why it isnt listed as I would think cork would provide excellent sound dampening, hopefully reducing some of the hollow noise laminate tends to leave. I know it is not recommend to add another padding if the laminate have one pre-attached.. however is my concern.. Always used 3-1 Robertson underlayment before..
Don’t want to overkill but looking for confort. Hi Karoline! Thanks for your question. You should not need a vapor barrier in this circumstance, as the tile and wood will not be emitting moisture. You will want to level your tile and wood floors before you lay a laminate. If you’re looking for a more premium underlyament for your project that includes sound dampening and more cushion, we’d recommend going with a non-attached underlayment floor and buy a higher quality underlayment. Thanks for mentioning that underlayment is essential because it allows a floor to float. I have multiple children, and I would like to have my floors be kid-friendly. Floors that float through the use of an underlay sounds like a great option when having kids in the home, so that will be something I’ll look into more. Hi Larry, thank you for your comment! Laminate flooring is a great option for a home with children – it is scratch, stain, slip, static and moisture resistant. We bought a 60’s house last year and we’re renovating it. We had OSB laid on floor joists, in some places the joints between OSB boards are uneven by 2-3mm, there’s lippage, and the OSB boards don’t go up to the wall, the installers left a 1-2cm perimeter gap along the edges. I don’t know if this is good or bad. Underneath this floor is a large void, our foundation doesn’t have a DPC or insulation except in the walls. We live in a cold, wet climate and have moisture problems. We plan on putting pergo laminate. What is the best underlay for this situation? We need to put something that prevents damp, insulates, fixes uneven levels between osb boards (2-3mm) and good sound insulation. Is there a 4 in 1 underlay for this or can i put DPC first and then a 3 in 1 or something like that? Thank you. Hi Alice – thank you for your question! You will have to make sure your subfloor is even before you can lay any underlayment or new flooring. No underlayment will fix major subfloor imperfections like you mentioned. Once you have an even subfloor, we would highly recommend our Bestlaminate 3-in-1 Felt Flooring Underlayment. It’s 4mm thick and the felt is perfect for retaining warmth in rooms. It comes with an added vapor barrier which will keep out the moisture and it comes with an overlap and adhesive strip for easy installation. Feel free to give us a call 800-520-0961 or order online! Hi Alice, unfortunately, we do not ship to Europe. We only ship to the contiguous 48 United States. I am putting 30mm of extruded foam insulation then particle board then a thin plastic sheet then cork and laminate flooring. I was wondering if the particle board will be affected after 30mm of insulation it was not taped. Hi Drew – If I am not mistaken by the information you are giving me, you are creating a wood subfloor on top of a concrete subfloor. Yes, the particle board can be affected, because it doesn’t sound like you installed a vapor barrier underneath the 30mm foam insulation. Your laminate flooring will be protected, but your subfloor will not. Do I need to use underlay if I am going to install laminate over existing vinyl sheet flooring, there is no need for moisture or noise reduction in this installation. Can I stack 2 pieces of floor muffler? Hi Val, thanks for your question. You should never use two layers of underlayment, as it can compromise the joint integrity of your flooring. The floor muffler will provide excellent sound and cushion on its’ own. Let us know if you have any other questions! i have a laminate flooring in the hall way that is 14.3 MM thick. I am not to fond of that flooring and would like to put a different flooring in the bedrooms that is 7 MM thick. It has no barrier or padding on it like the other one. I want them to be even and I dont want annoying transition pieces in the door way. I figure I will need to get a padding or vapor barrier 3 in 1 that is 0.25 inches or 6 MM thick. What do you recommend? When we took out the carpet i compared the thickness of the padding under the carpet and it was just about the right thickness that I would need to get the right height. I contemplated using an underlayment and then using a carpet padding. I cant seem to find an underlayment that has enough padding to meet the requirement of the height of the already existing laminate flooring in the hallway. Hi Marilea – You cannot use carpet padding under your laminate flooring. You have to use laminate flooring underlayment under your laminate flooring. Laminate flooring underlayment is at most 4mm thick. Laminate flooring underlayment cannot be too thick or it will compromise the joint integrity and be too bouncy – causing the joints to fail and your floor’s locking system to break. Even if you were to use thicker padding, the locking systems of the two different floors will probably not lock together, so you would still have to use a transition molding to connect the gaps between the floors. I hope this helps you. I’m sorry that there isn’t a better solution. Hi John, thanks for the question! It will depend on what your goals are with an underlayment. Are you looking for sound reduction? Thermal insulation? Lighter on the foot? A floor with attached underlayment usually comes with a standard foam padding. If you want added cushion and more features, we would recommend going with a better grade underlayment. You can check out all of our underlayment options here: https://www.bestlaminate.com/accessories/underlayment/. Let us know if you have any additional questions! We are replacing dining room carpet with Pergo Max. I have also purchased Pergo gold underlayment. The floor is particle board and had some mold issues. Carpet padding had stuck to fool as well. We have removed all carpet, scrapped up all padding, scrubbed with vinegar and water then applied a coat of Zinsser sealer. Can we just put the Pergo Gold over this or should I add a 5 mm plywood type underlayment to get a smoother surface? I do not want to ever have to redo this flooring again! Hi Buck – thanks for your question! With any laminate floor, you will need to have an underlayment. We’d recommend going with a 2-in-1 vapor barrier padding if you have seen moisture issues. From what I see, it looks like your Pergo Gold Underlayment should do the trick! Good luck with your installation. thanks for the great write-up. I’m re-doing a den that is at grade on top of concrete. I want to install pergo laminate flooring like in the kitchen (above grade and seems to be holding up well) in the den. The den previously had carpet and the subfloor is a painted particle board. Never had any moisture issues with the carpet and no sign of water/mold under the particle board that was resting on the concrete. what do you recommend? vapor barrier still? Or really just my preference what goes on top of the particle board? Hi Matt, glad you enjoyed the article! If you’re installing laminate, you will need to have some type of foam underlayment if it isn’t already attached. In this case, you will probably be fine with a standard pad since it is over particleboard, but to be sure, you may want to install an underlayment with vapor barrier for a few extra cents. Here are two great options: http://www.bestlaminate.com/vapor-barrier-2-in-1-underlayment/ or http://www.bestlaminate.com/vapor-3-in-1-blue-underlayment-100-sq.ft-roll/. Hope this helps! Hello! I will be installing Coretec Plus XL over concrete in my basement. Which is the best underlayment for this? Hi Ligia! If I am correct, the Coretec Plus product comes with an attached cork underlayment. You will not need any additional underlayment, and can install right over the concrete subfloor! Did you quit selling the Visqueen? Hi Laurie! We did not, you can find the Visqueen Vapor Barrier here: http://www.bestlaminate.com/visqueen-6mil-pe-vapor-barrier-block/. Let me know if you need help finding anything else! I am installing a thermo-soft heated mat system in my 12 x 12 ft. den, the laminate I purchased is Shaw Nature Element with no padding attached do I need a product like Robert’s First Step or would that be too much insulation between the heated mat and the laminate flooring. Hi Mike! Great question. We still recommend using an underlayment with the radiant heating system. You want to look for an underlayment with a lower R rating, so that the heat can easily move through the underlayment. We’d recommend the Floor Muffler http://www.bestlaminate.com/floor-muffler-ultraseal-2mm-underlayment/ for this case. Hope this helps! We are seriously considering laying Quick-Step Reclaime Malted Tawny Oak laminate in our home. by a color expert and/or design expert. Thank you for any assistance you can give. Thank you Alana for your quick response. You have been most helpful. You are welcome! Good luck on your project – don’t hesitate to reach out if you have any additional questions! Hello Alana. Thank you again for your prompt and informative replies. I am giving serious consideration to the 700 sf roll of the Muffler Underlayment, however I would like to know if a sample is available? I did read that samples of laminate are provided, however I didn’t note a request for underlayment. Hi Robert, you are welcome! I’m glad we could help. Yes, you can order samples of the underlayment. All you will need to do is fill out this form (http://www.bestlaminate.com/sample-request) with the underlayments you would like to see. 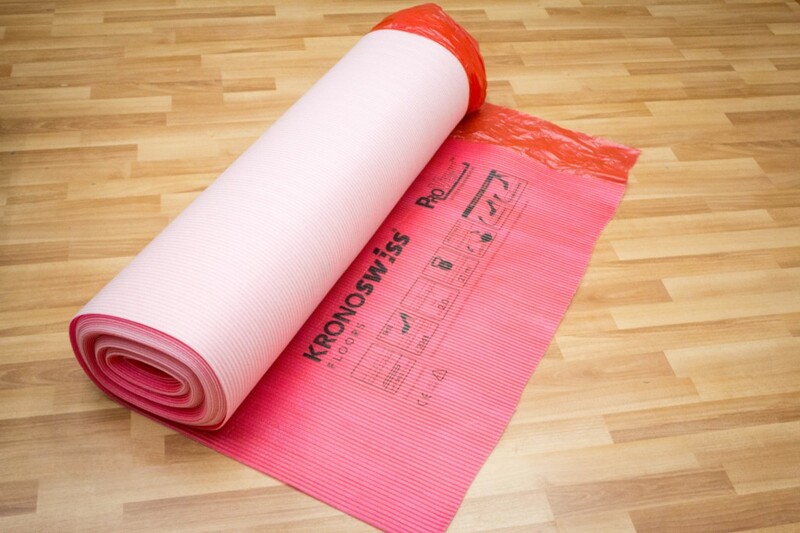 Additionally to Floor Muffler, the Kronoswiss Provent is another great option for a radiant heat system. Once you submit the form, we will get the samples out to you right away. I pulled up a laminate floor installed by previous owner a few weeks ago that had a felt with vapor barrier underlayment on concrete subfloor. Discovered there was mold under it. So I now want to put the flooring back down with a new and hopefully better underlayment more suitable for Florida humidity. The vapor barrier was on top so the felt got damp from the concrete sweating and developed mold. What would you recommend for an underlayment. PS – I have moisture treated the floor and also applied concrete waterproofing in attempts to slow the moisture down as you would do for a garage floor. Hi Jim, thanks for your question! One problem in the previous installation is that the vapor barrier should have been installed under the felt underlayment. One of our best underlayments for both sound and moisture is the Floor Muffler (http://www.bestlaminate.com/floor-muffler-ultraseal-2mm-underlayment/). You may also look into the Kronoswiss ProVent which has a humidity and moisture barrier (http://www.bestlaminate.com/provent-silent-vapor-3-in-1-underlayment-215-sf/roll/). You shouldn’t need the vapor barrier film (http://www.bestlaminate.com/visqueen-6mil-pe-vapor-barrier-block/) along with these two options, but you can also put it down for added protection and peace of mind. Hope this helps! Let us know if you have additional questions. What type of underlayment do you suggest? What “R Value” would work best considering the heating element goes over the underlayment? Hi Robert, thanks for your question! 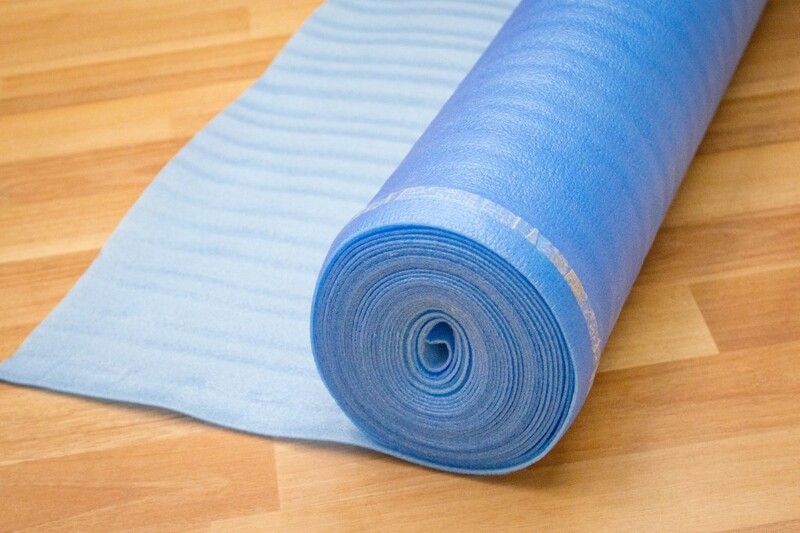 We would recommend using the Floor Muffler Ultraseal Underlayment. 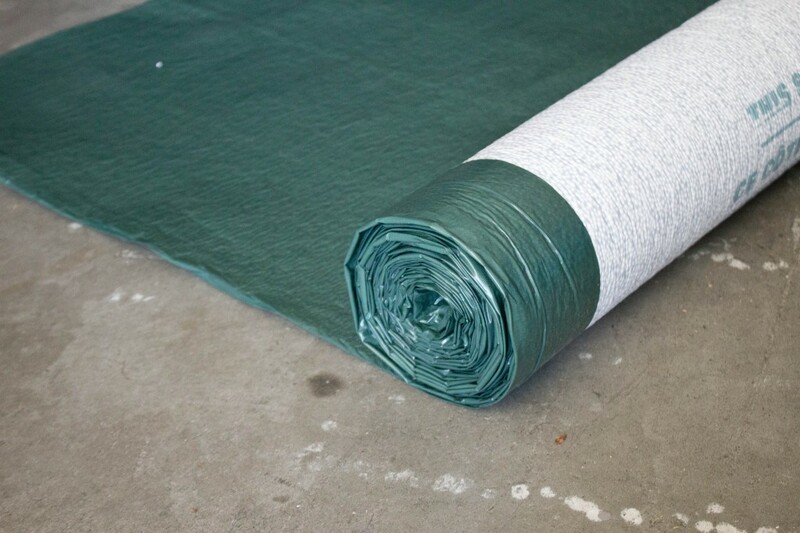 It is suitable for radiant heat and has a built in vapor barrier for over concrete subfloors. The R-rating describes the insulating properties, so the underlayment will help keep the heat from disbursing. The floor muffler is a good choice. Here are the details for the product: http://www.bestlaminate.com/floor-muffler-ultraseal-2mm-underlayment/. Let us know if you have any additional questions! Always be sure to check the manufacturer of both the floor and radiant heat system to make sure all of the materials are appropriate for installation. Thank you for suggesting the Floor Muffler underlayment. As previously stated, I need to install an underlayment over slab concrete as the first step, followed by the Thermosoft Heating mats and then the Pergo Laminate. Your instructions forlaying the Floor Muffler says to lay a roll, then lay the laminate, lay another roll, then lay the laminate and so on. I was planning/hoping to lay the underlayment over the entire floor, then lay the heating mats, then the laminate. I cannot lay the heating mats one mat at a time. I need to lay the entire floor area. Can I still use the Floor Muffler? Hi Robert – that is a great question! The reason they recommend this is just for ease of installation and helping to keep the underlayment flat. You can definitely lay the entire floor muffler down, as it tapes together at the seams. Hope that answers your question! Is there a difference in underlayment materials used for laminate floors, and those used with vinyl plank flooring? Or, can a single typ of underlayment be used under both types of flooring? Hi Dave! Thanks for your question. With vinyl flooring, you do not need to use an underlayment. The material is thinner, so adding additional cushion can cause instability with the locking systems. 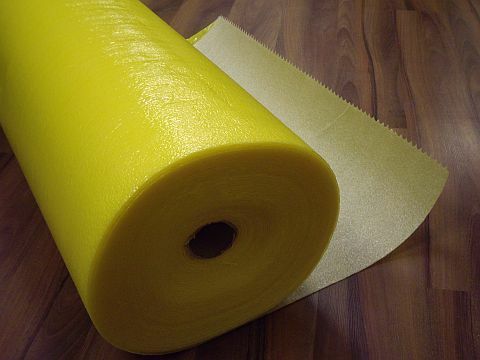 If you are worried about moisture, you could use this vapor barrier film: http://www.bestlaminate.com/visqueen-6mil-pe-vapor-barrier-block/. Be sure to read the manufacturer instructions for any underlayment specifications. Let us know if you have any additional questions! What type of underlayment is recommended for all wood subfloor. We also live in a raised house. We had issues with the floor buckling due to moisture from using Premium Underlayment with 2mm polyethylene foam laminated with a vapor barrier. We may have to cut old wood floor and make subfloor dry plywood. Hi Danielle! Thanks for your question. With a wood subfloor and raised home, we would recommend going with the Floor Muffler underlayment that has a strong vapor barrier: http://www.bestlaminate.com/floor-muffler-ultraseal-2mm-underlayment/. You can also opt to add double protection with laying a vapor barrier film first, and then installing the underlayment. Here is a link to the film: http://www.bestlaminate.com/visqueen-6mil-pe-vapor-barrier-block/. By doing this, you should have no problems with vapor! Let us know if you have any additional questions. Hi, i am having the same issues. We bought 12MM + 3MM padding Kingsington Manor laminate flooring from Lumber Liquidator. The salesman stated that we needed to buy the Bella premium underlayment for best results, sound proofing and heating and cooling bills. I am laying it in our main level of our house above the basement and it will be on plywood subfloors. It has carpet on it now but that is going to be removed and so is the carpet padding. Do I need to put down the Bella premium underlayment or not? It is ok and helpful to do so? I do not know about the exact products you purchased, as we do not carry those, so I cannot give you 100% accurate advice. Be sure to read the manufacturer directions first! Adding additional underlayment can void warranties if the flooring was not installed correctly. Hope this helped! In the introduction of your discussion on underlayments you make the statement “Perhaps your laminate flooring has underlayment pre-attached- what then? ” but it is never addressed. Is it okay to use a felt Roberts underlayment if the laminate already has an attached underlayment? Hi Craig! Great question! No, you would not use any underlayment if your laminate flooring has pre-attached underlayment. Adding unnecessary cushioning can actually be harmful to your floor. However, if you are installing over a cement sub-floor, you should lay down a vapor barrier, such as our 6mil Visqeen PE vapor block PE film, which does not have any extra padding. If you have any other questions, please don’t hesitate to ask! If it does have the attached underlayment are there any other options I can use to address the potential sound issues? Cork under pre-padded laminate possibly? The thing you have to be careful with is creating too much flex underneath your laminate flooring. If you put too much padding, the floor won’t be stable and it could become damaged and void your warranty. First, I would check your floor’s manufacturer warranty and see if there are any recommendations. But, Cork or our Floor Muffler could work because it’s more rigid than a felt underlayment and it’s thinner so you won’t have to worry about under-cutting doors. I hope this helps you! Can I use the 6mm visqueen under a sound dampening underlayment? Is it necessary? The visqueen coming in at 6mm, as opposed the the other products offering only 2-3mm of moisture protection concerns me a bit. I’m installing a 12mm laminate flooring with a concrete slab. The Visqueen is used to add a layer of moisture protection when installing on concrete. Most sound dampening underlayments come with a preattached layer of film for moisture protection. As long as there is a film made for moisture protection, the thickness does not make a difference. Roberts Silent 3 in 1 (http://www.bestlaminate.com/roberts-silent-3-in-1-vapor-underlayment-630-sf.-roll/) underlayment is the best option because it provides sound reduction, moisture resistance and corrects minor subfloor imperfections. If you already have an underlayment that does not have a moisture protection film, it is okay to install Visqueen underneath. Be sure everything is flat and well secured together. I hope this answers your question. For additional info, feel free to call 1-800-520-0961.